Using emoji in mobile phone has now become quite essential as it makes the conversation interesting and lively. However, have you ever wondered to use emoji for Windows 10? Since Windows 10 Fall Creator, emoji has become a system-level feature that can be activated with an easy shortcut. Meanwhile, it is also very convenient to use emojis for Windows 10 from third-party sources. 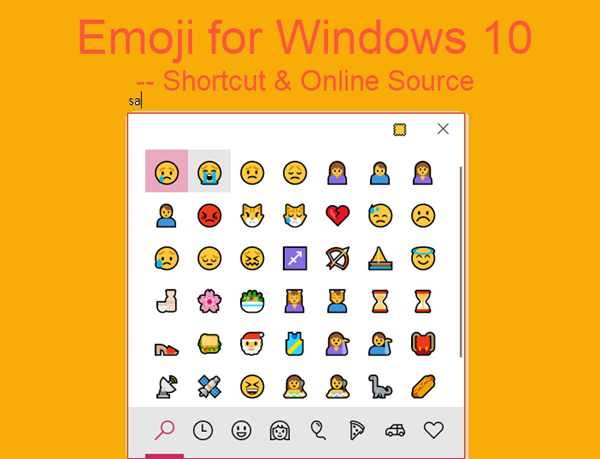 In this tutorial, we are going to learn 2 useful methods to use Windows 10 emoji. As we have said, emoji for Windows 10 now is as convenient as a shortcut command. 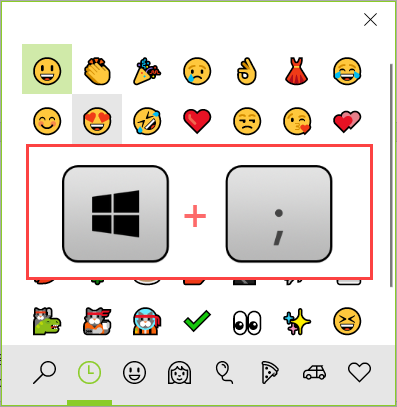 Once emoji for Windows 10 is activated with the shortcut, users can insert desired emojis in email, office document, search bar, messenger apps, or you name it. Don’t get excited too early. There are 2 requirements, otherwise you may find Windows 10 emoji shortcut not working. Upgrade Windows 10 to Fall Creators or above. Install English (US) language pack and keyboard. It is understandable that Microsoft is adding new features to Windows 10 gradually, so some functions, like Windows 10 emoji shortcut, are only accessible on latest build. Therefore, if your Windows 10 is not up to date, do it now. Make sure you did not disable Windows 10 update. Emoji for Windows 10 is actually not a major function, and it is now only available for English (US) keyboard. You must install the specific language pack and use Microsoft built-in keyboard. Step 1. Open the software or page where you want to insert emojis. Step 2. 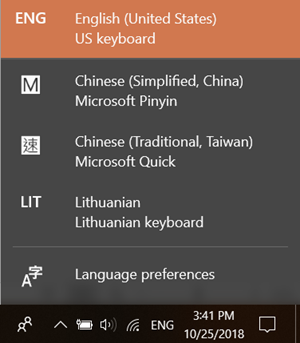 Make sure you choose English (United States) US Keyboard on the taskbar. Step 3. Press Windows key + ; shortcut. Now the emoji panel should pop up. Step 4. Select an emoji to insert into the destination text or box. You can also type a tag/keyword, then keyboard will show the matched emoji automatically. Note: Windows key + . (period punctuation) shortcut also works. In addition to emoji, data recovery is also a common issue that Windows 10 users are frequently facing. In case you lose important files, use the file recovery software as soon as possible. Even though Windows 10 Emoji shortcut is very handy, there are limits that some people don’t like. No problem. Keep reading for more options for typing emoji in Windows 10. Another way to insert emojis in Windows 10 is using third-party sources. You can browse emojis with any web browser on Windows 10. After clicking the site of getemoji.com, select the emoji or emojis that you want to use, then copy and paste those into the application or website that you are working in. Emojipedia.org is a more powerful emoji library, which is adopted by many other online sources. Visit the site, then enter a term to search in the search bar. All the emojis matching your requirements will be seen as a result. Click the desired emoji and all the details of that particular emoji will appear as how it looks on each platform. Under the description text, a copy button is shown up. Click or tap this copy button to copy the emoji and then paste this in any application or website you are working in. It doesn’t matter that you use emojis with emoji shortcut or online source in Windows 10, the emojis can be used on all online platforms, like Twitter, Facebook, Google Docs, Buffer, and local apps, such as Word document. By the way, you can also use emojis on Android with these emoji keyboard apps. Kindly share with us the interesting emojis you find.